Download "Energy Consumption Increases Slightly in 2015. 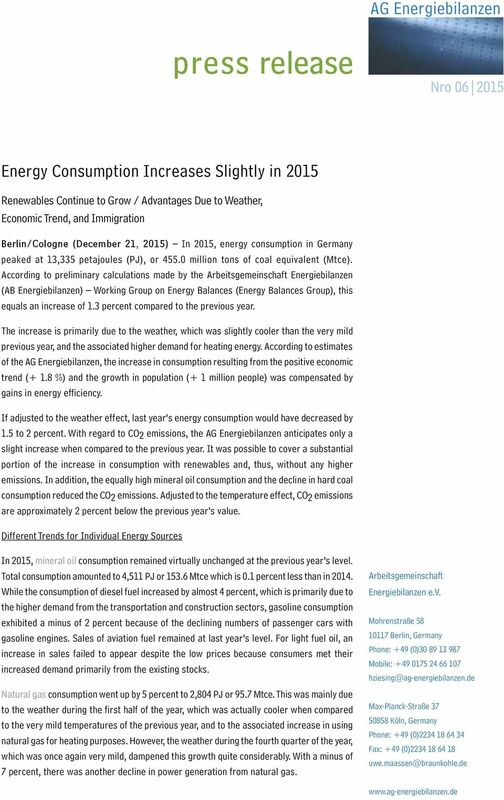 Renewables Continue to Grow / Advantages Due to Weather, Economic Trend, and Immigration"
1 Nro Energy Consumption Increases Slightly in 2015 Renewables Continue to Grow / Advantages Due to Weather, Economic Trend, and Immigration Berlin/Cologne (December 21, 2015) In 2015, energy consumption in Germany peaked at 13,335 petajoules (PJ), or million tons of coal equivalent (Mtce). 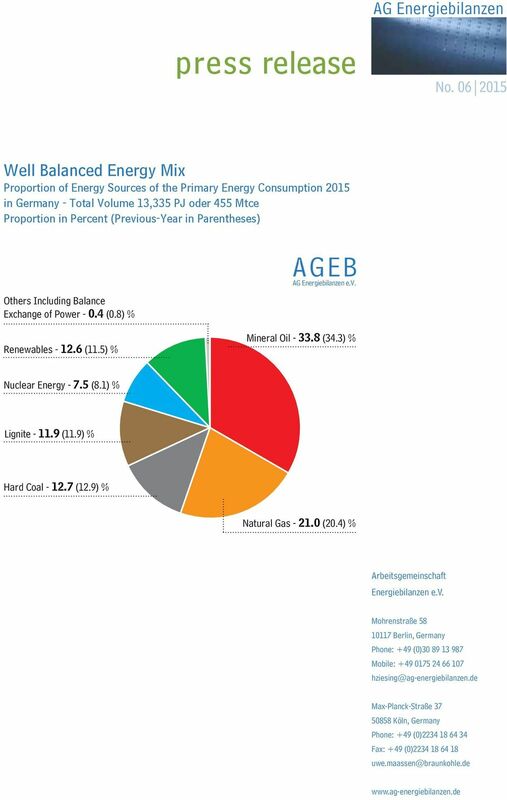 According to preliminary calculations made by the Energiebilanzen (AB Energiebilanzen) Working Group on Energy Balances (Energy Balances Group), this equals an increase of 1.3 percent compared to the previous year. The increase is primarily due to the weather, which was slightly cooler than the very mild previous year, and the associated higher demand for heating energy. 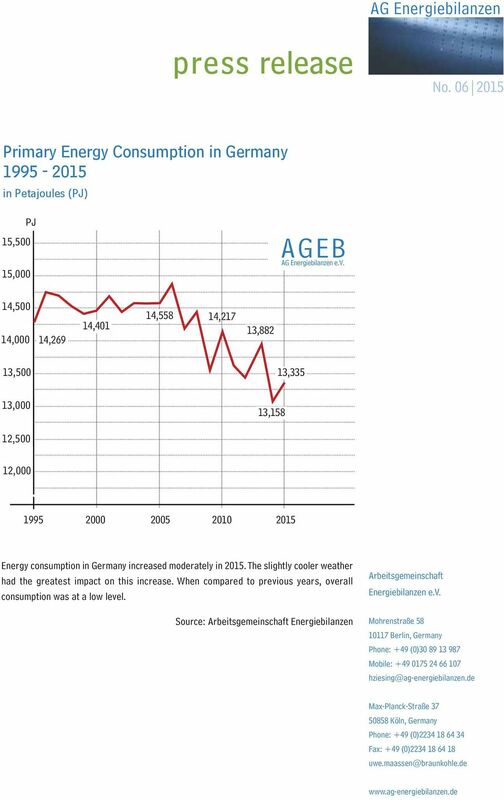 According to estimates of the AG Energiebilanzen, the increase in consumption resulting from the positive economic trend (+ 1.8 %) and the growth in population (+ 1 million people) was compensated by gains in energy efficiency. If adjusted to the weather effect, last year s energy consumption would have decreased by 1.5 to 2 percent. With regard to CO2 emissions, the AG Energiebilanzen anticipates only a slight increase when compared to the previous year. It was possible to cover a substantial portion of the increase in consumption with renewables and, thus, without any higher emissions. In addition, the equally high mineral oil consumption and the decline in hard coal consumption reduced the CO2 emissions. Adjusted to the temperature effect, CO2 emissions are approximately 2 percent below the previous year s value. Different Trends for Individual Energy Sources In 2015, mineral oil consumption remained virtually unchanged at the previous year s level. Total consumption amounted to 4,511 PJ or Mtce which is 0.1 percent less than in While the consumption of diesel fuel increased by almost 4 percent, which is primarily due to the higher demand from the transportation and construction sectors, gasoline consumption exhibited a minus of 2 percent because of the declining numbers of passenger cars with gasoline engines. Sales of aviation fuel remained at last year s level. For light fuel oil, an increase in sales failed to appear despite the low prices because consumers met their increased demand primarily from the existing stocks. Natural gas consumption went up by 5 percent to 2,804 PJ or 95.7 Mtce. This was mainly due to the weather during the first half of the year, which was actually cooler when compared to the very mild temperatures of the previous year, and to the associated increase in using natural gas for heating purposes. However, the weather during the fourth quarter of the year, which was once again very mild, dampened this growth quite considerably. With a minus of 7 percent, there was another decline in power generation from natural gas. 2 Hard coal consumption in 2015 dropped by 0.7 percent to 1,691 PJ or 57.7 Mtce. Hard coal participated in an increase in power generation in Germany also because of the very low global market prices. The use of hard coal in power plants, thus, decreased only moderately by about 0.8 percent. Sales to the iron and steel industry remained stable at the previous year s level. 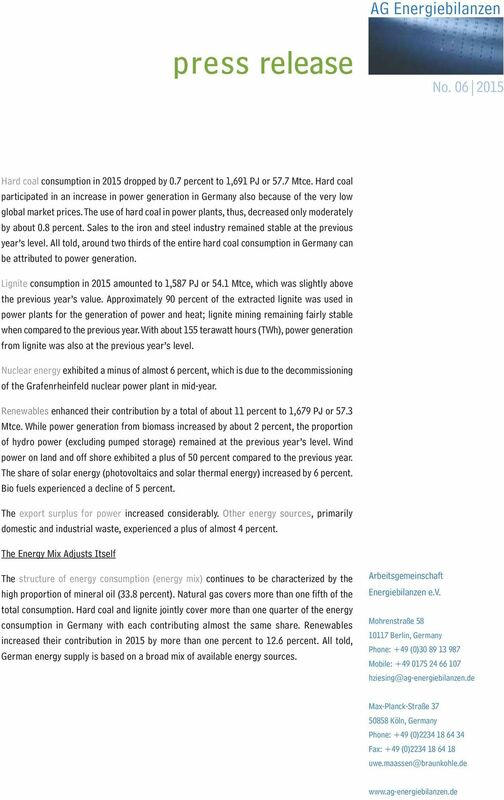 All told, around two thirds of the entire hard coal consumption in Germany can be attributed to power generation. 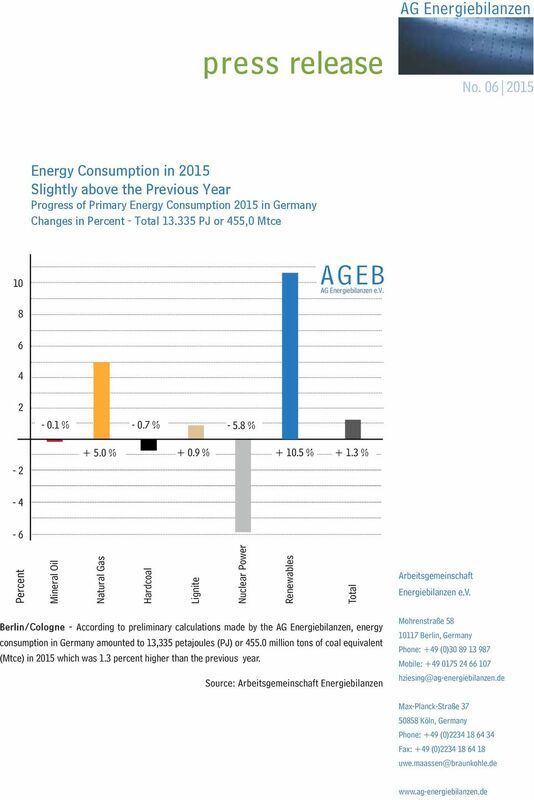 Lignite consumption in 2015 amounted to 1,587 PJ or 54.1 Mtce, which was slightly above the previous year s value. Approximately 90 percent of the extracted lignite was used in power plants for the generation of power and heat; lignite mining remaining fairly stable when compared to the previous year. With about 155 terawatt hours (TWh), power generation from lignite was also at the previous year s level. Nuclear energy exhibited a minus of almost 6 percent, which is due to the decommissioning of the Grafenrheinfeld nuclear power plant in mid-year. Renewables enhanced their contribution by a total of about 11 percent to 1,679 PJ or 57.3 Mtce. While power generation from biomass increased by about 2 percent, the proportion of hydro power (excluding pumped storage) remained at the previous year s level. Wind power on land and off shore exhibited a plus of 50 percent compared to the previous year. The share of solar energy (photovoltaics and solar thermal energy) increased by 6 percent. Bio fuels experienced a decline of 5 percent. The export surplus for power increased considerably. Other energy sources, primarily domestic and industrial waste, experienced a plus of almost 4 percent. The Energy Mix Adjusts Itself The structure of energy consumption (energy mix) continues to be characterized by the high proportion of mineral oil (33.8 percent). Natural gas covers more than one fifth of the total consumption. Hard coal and lignite jointly cover more than one quarter of the energy consumption in Germany with each contributing almost the same share. Renewables increased their contribution in 2015 by more than one percent to 12.6 percent. All told, German energy supply is based on a broad mix of available energy sources. France Electricity Report for 2014 Press kit Contents 1. The consumption drop 6 2. The development of renewable energies 8 3. The fossil fuel power generation slump 9 4. The CO 2 emissions decrease 5. Section 4 - Gas. Net imports increased by 6.6 per cent in comparison to Q1 2015. (Chart 4.4). Section 4 - Gas. Net Imports increased by 56 per cent in comparison to Q (Chart 4.4). Please address your inquiries to balances@iea.org. The Energy Situation in Mexico Mexico's total energy consumption in 2014 consisted mostly of : petroleum (45%), natural gas (40%). Natural gas is increasingly replacing oil in electric power generation. AUSTRALIAN NATIONAL GREENHOUSE ACCOUNTS Quarterly Update of Australia s National Greenhouse Gas Inventory September Quarter 2013 Commonwealth of Australia 2014. Published by the Department of the Environment. 2. The German energy transition is driven by citizens and communities. Guidelines for development and documentation of fuel cost policies are located in PJM s Manual 15: Cost Development Guidelines. Relevant sections of Manual 15 are included in the Appendix of this document. 7th TYNDP WS, Riga, March 22, 2013 David Viduna, Head of Long-term Origination, ČEZ, a.s.